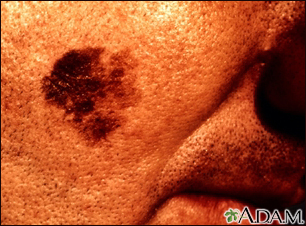 Increased risk for skin cancer, especially melanoma, is associated with chronic exposure to sunlight, blistering sunburns, and a family history of skin cancer. Reviewed By: David L. Swanson, MD, Vice Chair of Medical Dermatology, Associate Professor of Dermatology, Mayo Medical School, Scottsdale, AZ. Also reviewed by David Zieve, MD, MHA, Medical Director, Brenda Conaway, Editorial Director, and the A.D.A.M. Editorial team.